FastStone Photo Resizer is a batch image converter/resizer that enables users to convert, rename, resize, crop, rotate, change color depth, add text and watermarks to many images at one go. Supports file renaming and a conversion preview is available before processing. Any set of conversion settings can be saved for future use. How to extract: Download the "portable" ZIP package and extract to a folder of your choice. Launch FSResizer.exe. Fixed a vulnerability that may cause program to crash on corrupted or ill-intentioned images. @ pravin007techno: Use the given download link. @ MILKO: It was entered to the TPFC-database in January, 2007 ... so I won't call it a "new" program. I've been using the FS Image viewer for some time and it is a very useful app that I use all the time, I hope to get the same usefulness from this new program.Thanks for the hard work. Which DOES resize and DOES preserve the original format of each file (since it uses irfanview components), so basically it DOES what I need! I even had it on my system and never thought of using it... I am such a moron! My previous posts were about (the lack of) the "Keep Original Format" option and not about (the lack of) the "Keep Original File" option. In other words I do not want that during the resize/rename process my png, jpg, bmp, gif (etc.) files get ALL converted into .jpg files. In the previous line (just above this one) ".jpg" is merely mentioned to indicate ONE single format (i.e. "jpg" could be just as well "bmp" or any other format/extension). Bottom line: This is not about keeping (a backup of) the original files with their (original) size and name*** but rather about preventing that the file format/extension of all the processed file gets arbitrarily modified and converted into one single format/extension. @spicydog to clarify re shopping around, I meant look at each software option in case there are ones where the batch resizing tool deletes or overrides the original images. Apologies for any confusion, hopefully this clears it up. 2. DB sizer is also quite good. It has a sharpning that is actually quite good. Sorry, I did not manage to understand your suggestion, could you please clarify? webfork: doesn't IrfanView claim that Xnview has been copying their own software developments? How is it a better program if that's the case? I like IrfanView, but the one thing I find is that questions never run out. I work at Software.com and we get so many questions in the comments for IrfanView (eg the ones here: http://www.software.com/irfanview-plugins-9374-1), it's really hard to keep up. @spicydog, my suggestion would be to shop around a bit more, it's terrible losing the originals (or going to much more effort to work around the software). Yes, FastImageResizer is indeed very nice, but it also misses the "Keep Original Format" option (see my above post)... Should the developer be more responsive than FastStone (that shouldn't be too difficult, lol) I might suggest him/her to introduce that (useful) feature in a future release. FastImageResizer v.98 is a great batch photo resizer and it is portable too. spicydog: IrfanView and Photoscape both have batch tools, but I'd recommend trying Xnview first. In "Output Format" I miss the "Keep Original Format" option... Is it hidden somewhere? 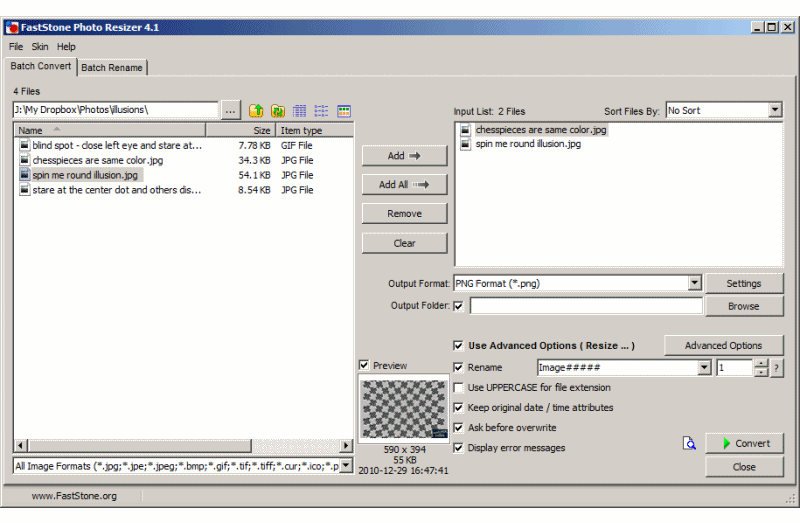 Assuming that I have a folder containing multiple png, jpg, bmp files and I want to batch resize them all to a specific size (or batch rename them all to a specific name) without the "Keep Original Format" option during the resize/rename process the format of some of the files will unavoidably change, whereas if that (useful) option would be available I could just batch resize/rename all my images without having to affect the file formats. I have concluded that writing to FastStone is totally pointless as they just ignore users suggestions and bug notifications... A detailed mail that I sent (support@FastStone.org) at the beginning of April informing about the "Keep Original Format" (missing) option must have been ignored too since I never received a reply nor I see that issue being fixed in newer releases. Anybody can suggest another good batch photo resizer? I like it. Logical and reliable results. This program has been my program of choice for renaming. I've tried other renaming programs, but they seem to have way too many options with a high learning curve. This program is straight forward and easy to use for renaming. I don't use the resize feature, so when I click the "FastStone Resizer" I sometimes forget that it does that as well. I recommend you get this if you are a photographer or do multiple file renaming. If you use FastStone Image Viewer, you already have FastStone Photo Resizer... it's built in. I totally recommend this software especially when you are cleaning up the tags for your MP3 files. I search for the covers on the net and resize them to 300x300 ideal for including into the tag. Simple and does what it specifies. I use both IV and FSPR. I have about 80 users who save six tons of pictures on the server (W2k3) every month, obviously scattered all over the place on different shares, in folders ten levels deep, etc., eating up all the disk space. They know they shouldn't, they do it anyway. Because I'm such a nice guy, instead of simply deleting I resize those pictures every now and then. IV can't do what I need here because it can't save the resized files over the originals, it puts everything in the selected output folder. I need the files where they were so that my dear users can still find them after the rename. That's why I use FSPR. In terms of quality and speed it does the same job as IV. Then again, for viewing (and even for simple manipulation) IV has been my favourite for years now. Excellent software! This literally saves me an hour of Photoshop work every time I use it. Making thumbnails and adding watermarks used to fill me with dread, but now it's easy and takes about five minutes. All of the faststone apps do their job and do them very well. I'd not use anything different. And Irfanview is way over-rated, just 'cause everyone says it's good doesn't mean it's true. This is faster, simpler and better looking. Hey folks... I don't know whether this is better than Irfanview or not... but every feature (batch resize, contact sheets, etc.) that you mention as being the reason to have this app are already in IV... It's such a good app, that it is one of only 3 (the others are a firewall and anti-virus software) that I actually install on my main home PC (as well as hopping around with a portable version)! Irfanview DOES batch resize photos, and does a better job of it too. I like this and am adding it to my portables. The easy text overlay/watermark and variables won me over. At least to try further. It takes forever to load up however so I will be saving for special occasions. Works well. Lots of features. Watermark was an unexpected plus. Have since showed a bunch of dcam noobs how to use it. It's not SUPER simple, but anyone doing a lot of resizing will be wanting something with these options quickly after starting with something simpler. Haven't tested at length but the love FS software series. The long list of batch functions are 10x easier to setup than Photoshop macros. adamh: IrfanView won't batch resize pictures. I've used IrfanView for a long time, and it's true that the resizer has no advantage over IrfanView, but the FastStone Image Viewer (also free, also available as portable) has some nice features. It shows thumbnails by default, has a good slideshow viewer (like Irfan), does some nice batch renaming and image editing, and it also has an easy to use contact sheet creation ability, watermark addition, and screen capture in many options - full screen, foreground window, window, rectangle or freehand area which works well. Don't mind if I stick to IrfanView. IMHO this is just another app nobody is waiting for.